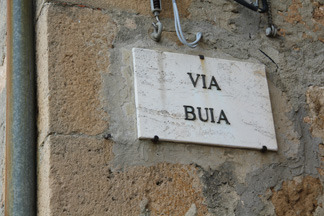 There’s this little street along the edge of Pienza (which is a lovely town, by the way), and it has four streets that are perpendicular to it. 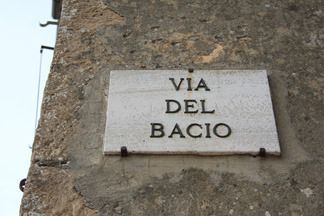 The first one I noticed was Via Del Bacio. Street of the Kiss. I thought, how sweet! I’d love to live on a street called that. 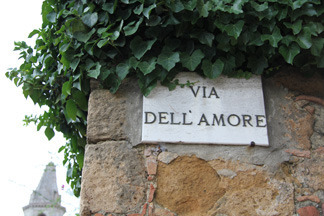 The next street was Via Dell’Amore. Street of Love. REALLY sweet, I thought. The city planner must’ve been a real romantic. I wonder what the next street’s called. 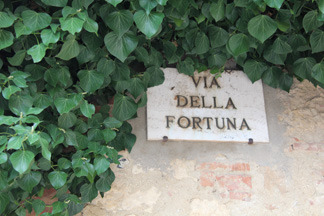 Street of Fortune. I excused myself from the family and told them I needed to check out that fourth and final street. Street of Dark, Black, Somber.